The apparition of a tall man wearing a top hat has been seen in the hallways of the hotel. The scent of perfume has been reported in many rooms of the hotel, and the spectre of a man has been seen in the hotel bar. Disembodied footsteps and ghostly voices have also been reported in the hotel. My friends mom who worked housekeeping at Best Western a couple years ago had in an encounter in one of the rooms on the third floor. Pillows would be thrown across the room by an unseen entity. While she would be making the beds her hair would be pulled also. Because I live in Ashland, WI I walk around town pretty often I was walking back from the marina behind Best Western and I saw someone standing in one of the rooms windows and then just disappear.. Rumor has it that the original owners daughter Molly had jumped to her death from the third floor of the building. I worked here, I seen the tall man in a black top hat. It was not unusual for guests to walk in the back doors into the halls to their room, so I really thought nothing of it, but this man did not turn towards me, he went in the hall door from outside and straight into the last room at the end of the hall. I was standing near the computer that had complete outline of rooms and what rooms were and were not rented and found that room to be unrented for the night. Wondering if it may have been a mistake and/or someone received a card key that shouldn’t have, I started down the hall to only make it half way when the hair on my arms and the back of my neck stood on end……..needless to say, I went back to the front desk, sat on a bar stool type chair and watched down that hallway till I was relieved for the night by the nightshift person. I had multiple eerie and strange occurrences in this hotel and the gal above is correct…..a third floor room had MANY occurrences take place. One gal who rents the third floor room said she got up in the middle of the night for a restroom break and when going back to bed, just got finished getting comfortable and felt something sit next to her on the bed. One time a couple of the gals that cleaned rooms at the Hotel C came down to the front desk to let myself and the manager at the time know the room in questions closet light would turn off for them, but immediately turn back on when they left the room………we both went up, found light on, turned it off and left, went back in for a peek and sure enough….we all decided to leave the light on…..whatever was going on could keep going on…..I know it may seem funny, but it bugged me from time to time and ANY time I would go up to that room to check the light in the closet it was on. I had a bartender that hated being alone during close and would sit with her n wait for her to just finish lights or such and on many of those occasions we heard the sound of a glass cup with ice in swirling around……..if you don’t know what that sounds like take a glass jar and put a few pieces of ice and maybe half filled with water in and swish slow. But that was not all, we also smelled cigar smoke down there a few times and there is NO smoking in the Hotel C.
Definitely haunted. We took our kids on a family trip to Bayfield. We were able to get a room there for free, due to frequent points. We stayed on the 2nd floor. At 3 am, i was still not really able to sleep. Suddenly i heard someone whisper my name very clearly. At first, i thought it was my husband. But when i lifted my head and looked over at him, i saw he was sound asleep. That’s when i felt the hair on my arms stand up, and a “thickness” in the room. It was so extreme, that the next day i looked the hotel up with the word “haunted”. That’s when i saw itvwas listed one of the top 10 haunted hotels in WI. Absolutely beautiful hotel! But definitely haunted. I’m the gal mentioned in the comment above who had someone sit next to them on the bed and the story is true, except there’s alot more to it. My husband and I used to frequent the hotel several times a year and would always stay in the turret room in the end of the 3rd floor. The 1st time we stayed there was about 10 years ago. I was told by the hotel manager that housekeeping staff don’t even like the 3rd floor and have heard noises coming from unoccupied rooms. So anyway, the turret room is a hot tub suite and is very large, with a bank of curved windows overlooking Lake Superior. When we decided to go to bed we were too warm to cover with blankets so we just covered up with the the sheet. I awoke about an hour later to use the bathroom and realized that my husband and I had been totally covered up with all the blankets, which had been tucked in around us as if the bed were made on top of us. I woke my husband and asked him if he covered us and said no. I then got up to use the restroom and without turning on the light sat down. The seat was up and I got a little wet if you know what I mean. I wasn’t very happy about that and woke my husband again to ask why he left the seat up. He said that he hadn’t even used the restroom since I’d been in there last so he couldn’t have left it up. We were laying there in the dark trying to figure out what’s going on when all of a sudden we hear the door knob on the door that opens to the hall start to jiggle, like someone wants to get in or out. My heart’s pounding like crazy and in the time it would take some one to walk across the room from the door to the bed, I feel a person sit down on the edge of the bed next to me. I don’t think we slept much that night & the next day we saw orbs flying around the room after we came back from a swim. This was only our first visit. Every single time after that we had other occurrences like plastic shopping bags being riffled through in the middle of the night, a flashlight turning on by itself in the middle of the night, the TV turning on by itself, closet lights turning on by themselves, and thumping/banging on the wall during the night coming from the room next door which was closed for renovations. These things were experienced by both my husband and I but the most disturbing and scary thing that ever happened to me was in January of 2014 or 15. It was the same hot tub room on the 3rd floor, the turret room and I was awoken by something that had crawled under the covers and was climbing up my legs. I felt this thing slowly moving up the side of my body and it felt like it was about the size of a raccoon but not with any form that could be seen. It had weight and mass enough that it pushed me into the bed and actually lifted the blankets above it. As it got to my shoulders I felt little protruberances go around with sides of my neck and my head was being pushed down into the pillow. The blankets lifted up as the thing moved over my head and suddenly I felt the weight lifting off me & the covers fall back down on top of me, almost like a whoosh as the thing flew up into the air above the bed. This attack lasted maybe 2 or 3 minutes but seemed like much longer and I was trying to talk but couldn’t get any words out. When it was over I started crying and by this time my husband was awake because he heard me wimpering. I now won’t ever go back to the hotel. I feel that whatever’s there has become more menacing. I’ve talked to the hotel manager on several occasions and she knows all about the haunting. 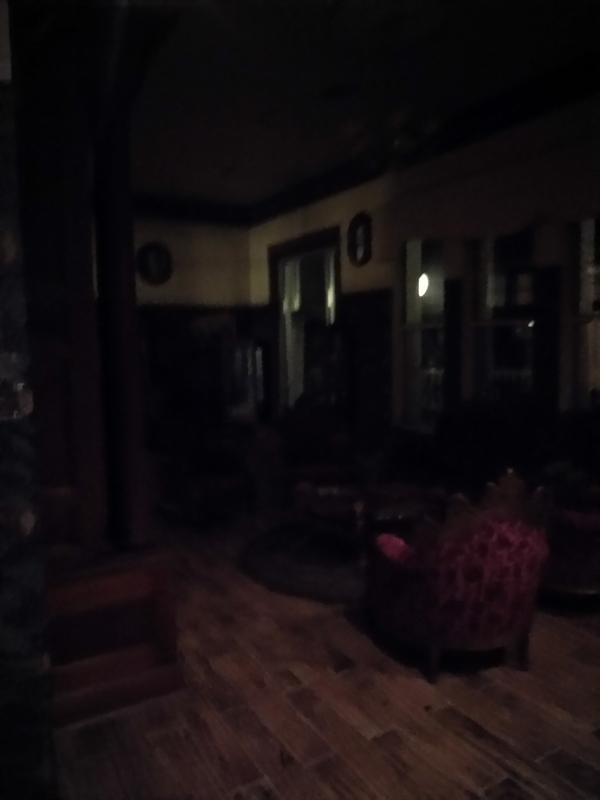 She said that the hotel isn’t that old but is built on the site of a bordello and funeral home that was there in the 1800’s.The hotel lobby is also furnished with several antiques so it’s possible something was attached to the furniture. Whatever or whomever is the cause for the haunting, this hotel is the most actively haunted place I have ever experienced. I was apart of the install crew that put in security cameras. We noticed events happening in the middle of the night in the indoor pool that is closed and locked. When reviewing the video a figure was seen over the water heading towards the camera. I told myself if I believed in ghosts this would be a reason. After I left the hotel I found out it was haunted, wish I saved that video. We were in attic and all over this hotel. I think it was around 2014. So this was a few years ago. I smelled the perfume and stuff, it was like a cloud of lavender that just sort of passed me while I was sitting there…alone…in the lobby. That’s not it though. I had a weird sleep experience, where I woke up in the middle of the night, and it kinda felt like I was not awake, but I was for sure awake. I not only heard footsteps, but I FELT footsteps pulsating through my body. It was by far one of the weirdest experiences I have ever had. I’m in room 208 and woke up to an orb of light going across the room. I thought it might have been light from outside but the curtains were shut tight. I stayed there this last weekend in room 324 and I have to say, I didn’t even know it was haunted til I was told our last day there. Didn’t hear anything, see anything or sense anything. Although I didn’t sleep well and became moody due to the lack of sleep, there was nothing out of the ordinary, and this coming from someone who is sensitive to the paranormal. I was there Friday night to Sunday morning.